The ED Protection is the best selling CAMP jacket for good reason. 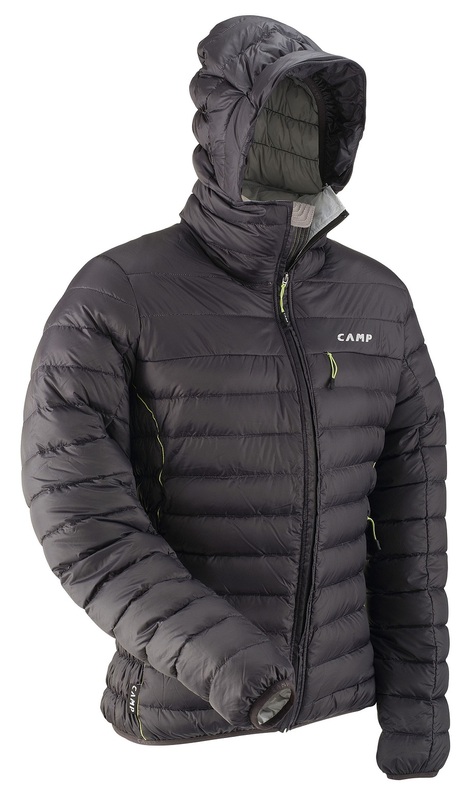 It's the perfect puffy for pulling out of your pack after a fast ascent and throwing on over your softshell and helmet. Weighing in at just 450 grams (15.9 ounces), the warm white goose down and weather proof Hitex shell will halt the chill that is creeping in. It can then pack down into its own stow-away pocket or be stuffed into a pack without complaint when you're ready for the next lap. 90/10 white goose down with 650 cubic inches of fill power to keep you warm. Superlight, durable Hitex (15D ripstop nylon) breathable shell to keep the wind out. DWR finish to repel wet snow and light rain. Helmet compatible full-size technical hood has a visor to help protect your glasses or goggles from droplets. Anti-jam system on the full length zipper will keep you focused on the task at hand instead of your clothing. Zippered hand warmer and outer chest pockets for stashing essentials. Elastisized waist and lycra cuffs will have you locked in without fuss. Two large inner pockets accompany the mobile phone pocket where it's warm and dry. The ED Protection is a slim fit, designed so you can ski freely without feeling like a marshmallow while easily functioning as an outlayer. It accomplishes this with stretch panels on the sides that will adapt to your current layering technique. Sizing: 6'1" 165lbs = Large. What size would fit me in this jacket @ 5'7" 145 ish. 39 inch chest. Hi Tim, I would go with the medium. You should be about spot on for it. I hope you can please help. I will be in the US in 2 weeks and would like to order an ED Protection Jacket on your website. I am concerned about getting the wrong size and hoping you can please assist or direct me to someone who can. I am tall and narrow (typical climber shape) and really want to avoid unnecessary bulk in a jacket. Some products are tailored “slim-fit” and others are a little more bulky - This Jacket seems to be slimfit but I am concerned about the length as I am tall. I cant find any suppliers of your jackets here to physically try, so would appreciate your help greatly. As soon as I have your recommendation I will process the order on the site. I have the L size ED Protection jacket. I am shorter (6'0") but have a wider upper body than you (41" chest) and I tried the M, L and XL and the L is the best fit for me. I found the XL to not be slim fitting enough and the M was all-round too small. With jackets I am a bit of a difficult fit as I have a slim torso but broad shoulders and chest/back, so for example with the ED Protection L I like the lower torso and arm fit but I find the shoulder/chest a tad tight. The XL would definitely fit your torso and arm length better but with your narrow frame you may find it too roomy, especially if you want a slim fit. I would not bother with the L as I'm quite sure you'll find it too short (and the arm length may not be sufficient). Hope that helps! PS - I tested the jacket in hours of continuous wet snow at Cypress Mountain here in Vancouver (classic Pacific NW winter ski conditions) and it was not waterproof as claimed - it sheds light moisture fine for a while (e.g. the first hour) but I was wet (although not cold) by the end of my 2.5-hour ski session. I believe the zippers and baffle seams were the culprits in eventually letting the water in. Thus if you're looking for a truly waterproof all-in-one insulating jacket, this is probably not it; however, it has a good warmth-to-weight ratio and is otherwise a quality piece of equipment, especially if you can find it at discount (I got in on The Clymb for less than $200). Hi Evan, I'd agree with Maine, less than the XL is probably short. The XL is still on the slim side, but may be roomier than you want. I wear the large as an outer layer (6'1", 38" chest) and find it just right throughout.